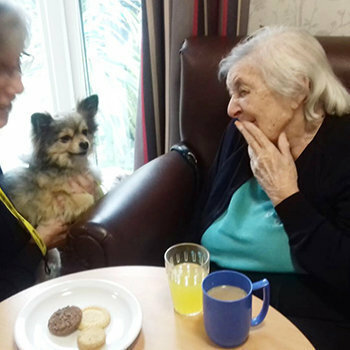 Windle Court care home in South Woodham Ferrers, close to Chelmsford in Essex, were happy to welcome their friendly and loving PAT dog, Poppy, back into their home after their furry friend underwent an operation on her legs. Poppy made up for her time away from our residents with lots of hugs and licks on her return! Runwood Homes welcomes Pets As Therapy animals to provide companionship, stimulate and uplift our residents. 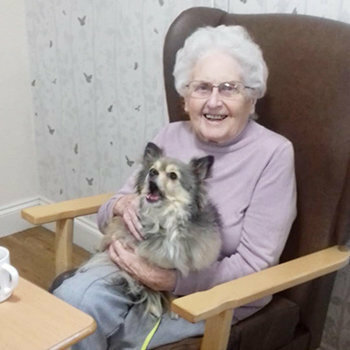 Bringing pets into our residential care homes acts as a holistic therapy approach to improve the lives of people living with debilitating mental and physical health conditions such as dementia, which accounts for approximately 80% of our care home residents. We thank the trusted volunteers at Pets As Therapy and their amazing animals that enrich our residents lives. The health and wellbeing of those who we care for is always at the forefront of our care mission.